Ambulance stuck on dirt road in Inverness. 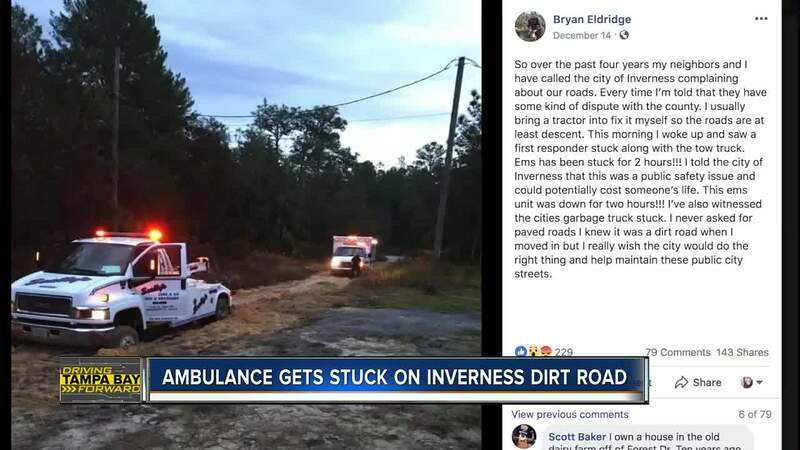 INVERNESS, Fla. — An ambulance got stuck on a dirt road that neighbors have been trying to get government officials to fix for years. Now, one of the main problems is finding out who should repair it. Matthew Pierce says his mother was having a seizure and needed an ambulance, early Friday morning. But the ambulance became stuck on the unmaintained dirt road. "It was an hour after the first ambulance got stuck that they were able to get another ambulance here for my mom," said Pierce. Matthew says his mother is recovering but things could've been much worse. "Whenever there's a rain it becomes a river. It's all sludge, water, and mud, it's not even a road," said Pierce. He says people get stuck on it all the time. He says he and neighbors have been trying to get the road fixed for years, but they always get the runaround from government officials. So we went to the City of Inverness and they showed us documents from 1970, showing that the City of Inverness received the land from the county with the exception of the roads. The community says they just want someone to step up and take responsibility before someone gets hurt or dies because of it.